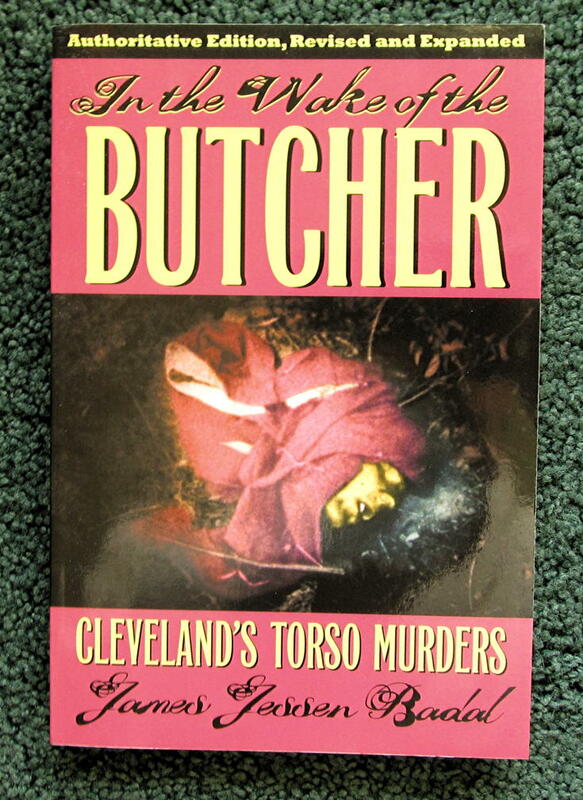 Book Notes: James Jessen Badal's "In the Wake of the Butcher: Cleveland's Torso Murders"
Not long ago I read a wildly interesting true crime book, and I thought that I should add it to my crime posts. 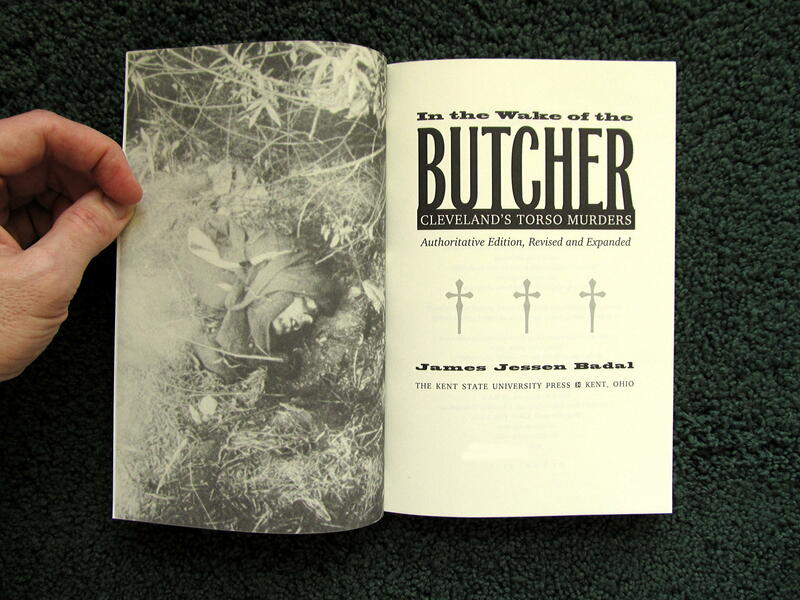 The book in question is James Jessen Badal's In the Wake of the Butcher: Cleveland’s Torso Murders. But, first, some photographs to get you started. Here are the cover and the title page. 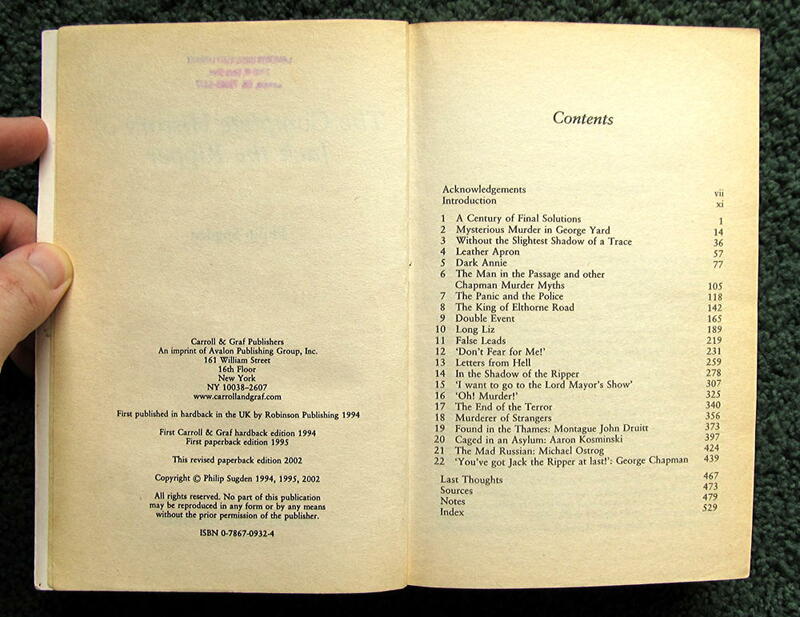 Next, the table of contents. As you can see, I read the revised edition, which was published in 2014. Because I haven't read the original edition, I can't compare the two versions of the book. But, of course, you should stick with the 2014 edition, since it's the more recent one. As the title indicates, Mr. Badal's book is about the Cleveland Torso Murders, a series of twelve unsolved homicides that took place between 1934 and 1938. The story of the Mad Butcher of Kingsbury Run doesn't seem to be much discussed these days, which is odd, since these serial murders intersected with the career Eliot Ness, who became the Cleveland safety director during the time of the murders. Given Ness's place in American popular culture, regardless of how inaccurately his exploits are usually portrayed, you would think that more attention would be paid to his hunt for a serial killer. It's hard not to think that we won't eventually see a major Hollywood movie based on this story. Mr. Badal makes a good case that Ness and the Cleveland police managed to identify the murderer, a doctor named Francis Edward Sweeney. Unfortunately, though, they were never able to prosecute him for the crimes. He spent much of the remainder of his life in and out of mental institutions, occasionally sending a taunting postcard to Ness through the mail. If you read much true crime writing, you've no doubt noticed that a lot of it, stylistically speaking, doesn't rise above the level of semi-literacy. Fortunately for us, Mr. Badal's book is highly literate. I found his book to be well written and properly sourced. He does his best to support his conclusions with real evidence, and thus avoids the sort of speculation that sometimes ruins an otherwise good true crime book. As maps go, these aren't especially informative, and since Cleveland doesn't have much of a place in our popular imagination, I sometimes had trouble getting a sense of where the murders took place. Some aerial photographs of Kingsbury Run would have been helpful, I think, but perhaps there are no such photos from the 1930s. Since part of the mystery surrounding the murders involves precisely where Dr. Sweeney (if he was in fact the killer) killed, decapitated and dismembered his victims, perhaps it was fitting that from time to time I had trouble imagining the killer's hunting grounds. But don't let the poverty of my imagination deter you from reading this excellent book. I highly recommend it. One word of warning. Mr. Badal's book contains several grisly photographs of the Mad Butcher's victims (or, in some cases, merely their severed body parts). So just keep that in mind if you're squeamish about such things. Mr. Badal has written two other books connected to the Cleveland Torso MurdersThough Murder Has No Tongue: The Lost Victim of Cleveland’s Mad Butcher and Hell’s Wasteland: The Pennsylvania Torso Murdersthat I hope to read someday. I'm reading a lot about crime these days, partly because the general topic interests me, but also partly because I've read a bunch of Colin Wilson's books during the past few years. I mentioned my interest in Wilson's work in an earlier post, and I hope to post about his ideas about crime in the near future. My own work has been taking up a lot of my attention, and so recently I haven't had much free time for blogging about my reading. But I just finished Robert D. Hare's Without Conscience: The Disturbing World of the Psychopaths Among Us, and I thought that I should say something about it. It's a fascinating book, and certainly one that is relevant to criminology. After all, many criminals have psychopathic personalities. Consequently, some rudimentary knowledge of Hare's work might come in handy to anyone interested in crime, be it fictional or non-fictional. 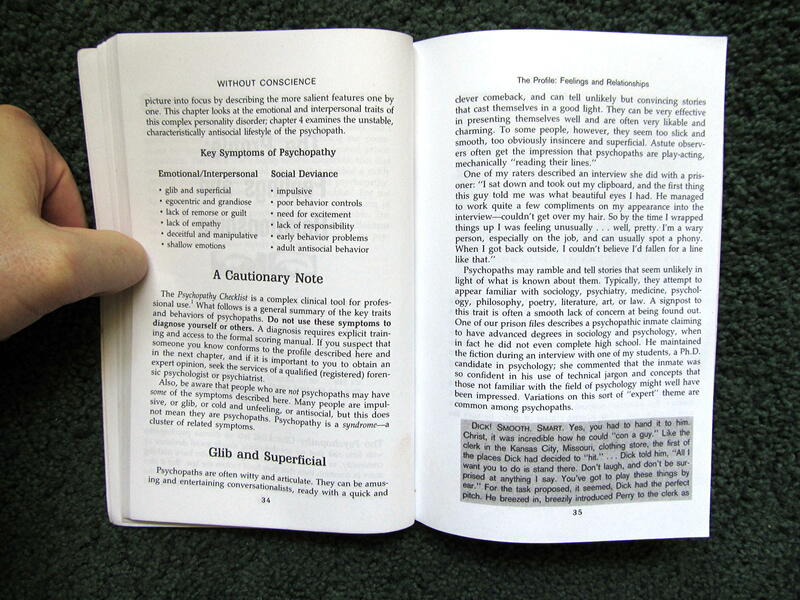 Below you'll find two images: one of the book's cover, another of Hare's list of the ten key symptoms of psychopathy. I have to admit that I was struck by how restrictively Hare formulates his concept of psychopathy. His checklist seems, at least to me, to epitomize confidence tricksters and unscrupulous glad-handing businessmen. Prior to reading his book, I assumed that lack of remorse and lack of empathy were the two salient features of psychopathy. Many people I would have characterizedin my casual way as someone who has not been trained in psychologyas psychopaths don't really meet Hare's more stringent criteria. 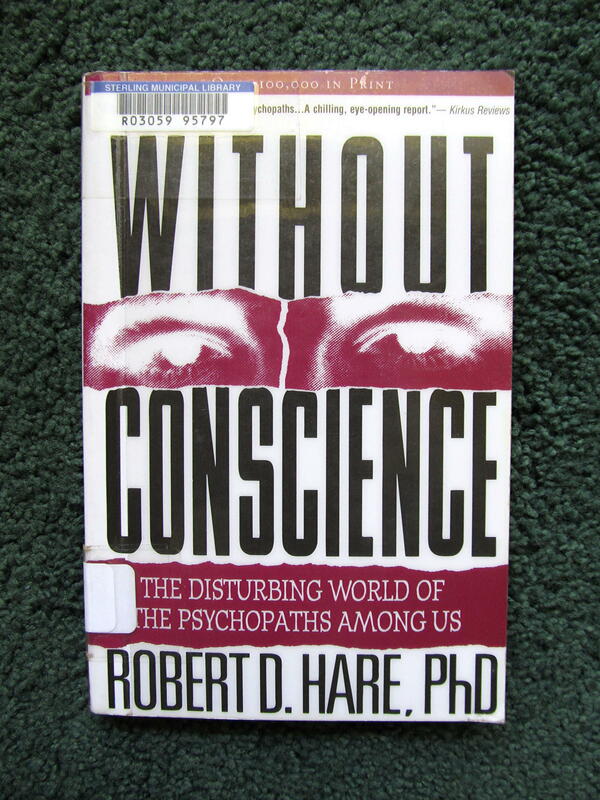 On page 175 Hare writes of psychopaths as leading "lives of callous self-gratification." I'm not sure that I've ever known someone who could be described in this manner, although I've known self-absorbed people who often acted in a callous fashion. Maybe that's the same thing under a different description. But there are self-absorbed people who can be brought to think and care about the consequences of their actions. It's just that they have to be pushed by outside influences to do so. Psychopaths, as Hare diagnoses them, just don't care, although they're often good at pretending that they do. When I taught at the University of Pennsylvania, I met a few business students who almost certainly were the unscrupulous glad-handing type, but I never got to see them in their full glory in the business world. But they have to come from somewhere, and I'm sure that Wharton graduates its share of them. How else can you explain the financial crisis of 2008? When I was in academia, I met many people who obviously possessed several of the traits on Hare's list. I guess, though, that their lack of imagination, their dogmatic certainty that they and they alone were in possession of the truth, and their indifference to the welfare of other peopleall of which taken together often produced behavior that seemed psychopathic to mewere what you should expect from highly introverted people whose scholarly training has convinced them that they belong to a special elite. But according to Hare's criteria, they shouldn't be classified as psychopaths. These people, whatever their faults, I would never have characterized as glib or impulsive. Some were certainly egocentric and grandiose, and obviously had shallow emotional lives, but they typically had tight control over themselves. You might say that their personal rigidity was intellectual and emotional. They easily excluded other people from their moral purview, and probably did so because they did not regard others outside of their elite groupings as worthy of respect and decent treatment. Hence their abominable behavior. That seems psychopathic to me, but Hare's research indicates otherwise. I guess that for Hare it's just a rather involved form of learned callousness (perhaps grounded on a natural shortage of sympathy and empathy) that doesn't go all the way down to the roots of their personalities as psychopathy does with psychopaths. Well, of course, I'm not in a position to settle this debate. I'm glad that I read Hare's book, and I recommend it to your attention. I'll take it as my starting point for future reading on the topic of psychopathy. Book Notes: Philip Sugden's "The Complete History of Jack the Ripper"
In two earlier posts I discussed two books about Jack the Ripper, Donald Rumbelow's The Jack the Ripper and Paul Begg's Jack the Ripper: The Definitive History. 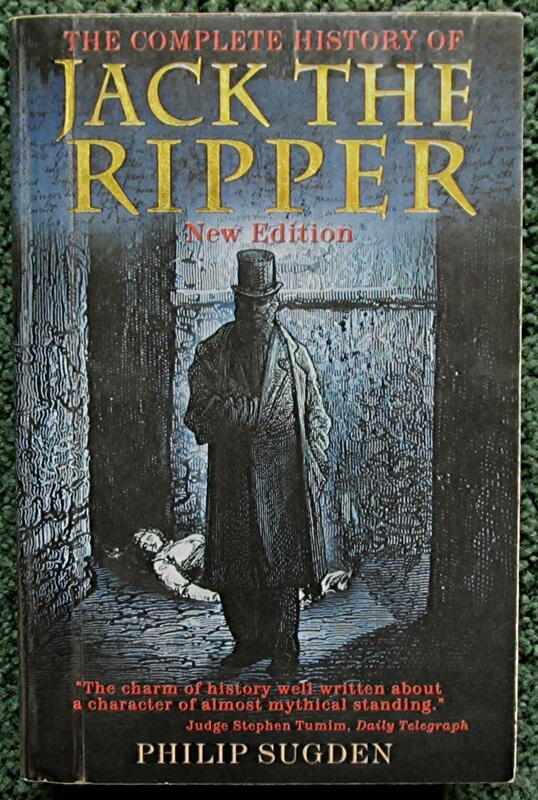 In this post I want to say something about Philip Sugden's The Complete History of Jack the Ripper. I suggest, though, that you read the earlier posts before reading this one. I got the 2002 revised edition of Sugden's book through my local library, so, once again, my copy is a little beaten up. 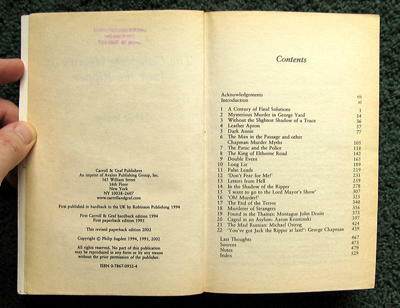 But these photos of the cover and the table of contents will give you an idea of what to expect. 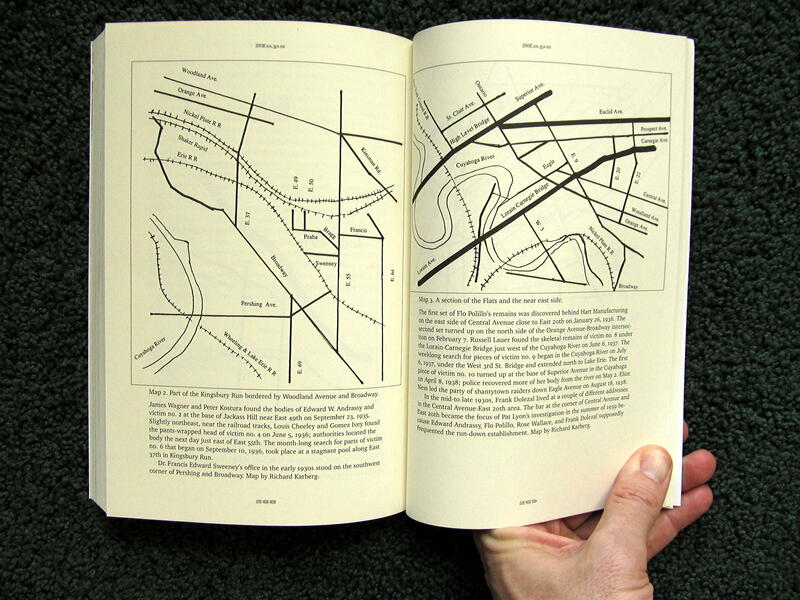 First of all, hallelujah, Sugden's book contains maps! This addresses one of the main complaints that I have about Rumbelow's and Begg's books. 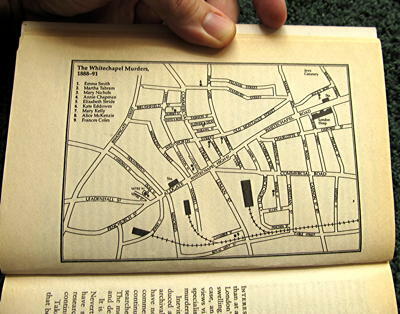 At the very beginning of the book you'll find a general map of the Whitechapel Murders. Here's a photo of it. 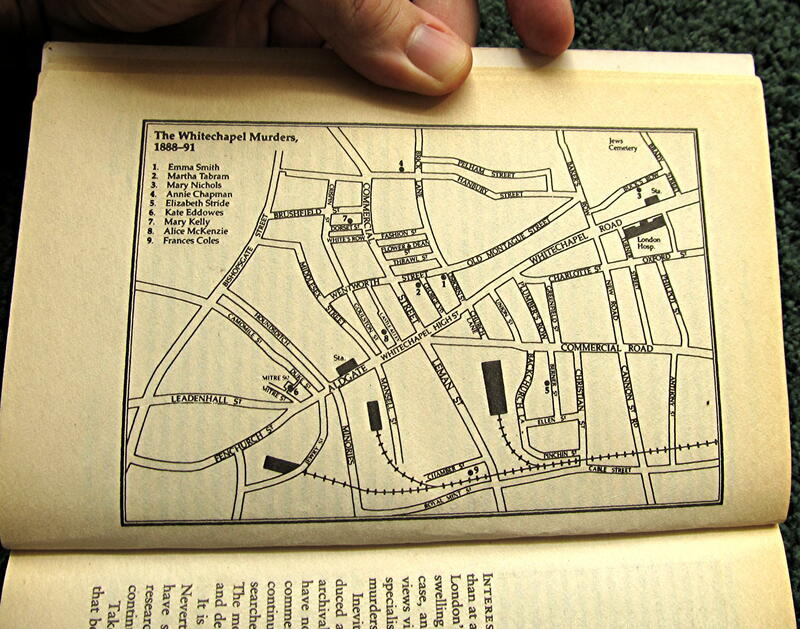 As you work through Sugden's account, you'll find smaller maps relating to each individual murder. Sugden's book is crammed with noticeably more detail than either Rumbelow's and Begg's books. So the maps are a great aid to understanding his reconstructions of the events. For this reason alone, I prefer his book to Rumbelow's and Begg's. Sugden's book contains extensive notes to document his claims. He clearly did an enormous amount of digging. Unfortunately, however, there is no bibliography, although there is a long list of archival sources. It's not that I can't live without a bibliography, but it would be useful to have one. One thing that differentiates Sugden's book from Rumbelow's or Begg's is that Sugden writes very little about the social history of the East End. Instead, he concentrates on the murders, and since his book runs to 500 pages, he provides a mountain of factual research and documentation. Sometimes it's a challenge to work through all of it, but ultimately it proves to be worthwhile. I admit, though, that some readers might find the level of detail overwhelming. In that case, Rumbelow's book might be a better choice, since even Begg's book is fairly heavy reading at times. As to the identity of Jack the Ripper, Sugden regards Montague John Druitt, Aaron Kosminksi, Michael Ostrog, and George Chapman as the most likely suspects. He exonerates, as far as he is concerned, Druitt, Kosminksi, and Ostrog. He considers Chapman the best candidate, that is to say, the least unlikely suspect, and judiciously concludes that the case against him has not been proven (which, Sugden is careful to point out, is not the same as saying that Chapman should be considered innocent). Of the three books, I like Sugden's the best, although it is certainly the most demanding because of its length and attention to detail. 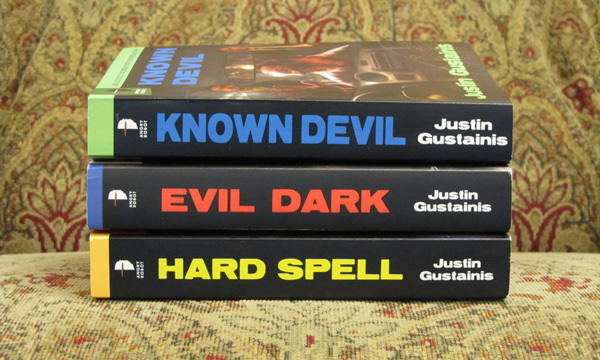 Readers should keep that in mind when trying to decide which of the three to read. 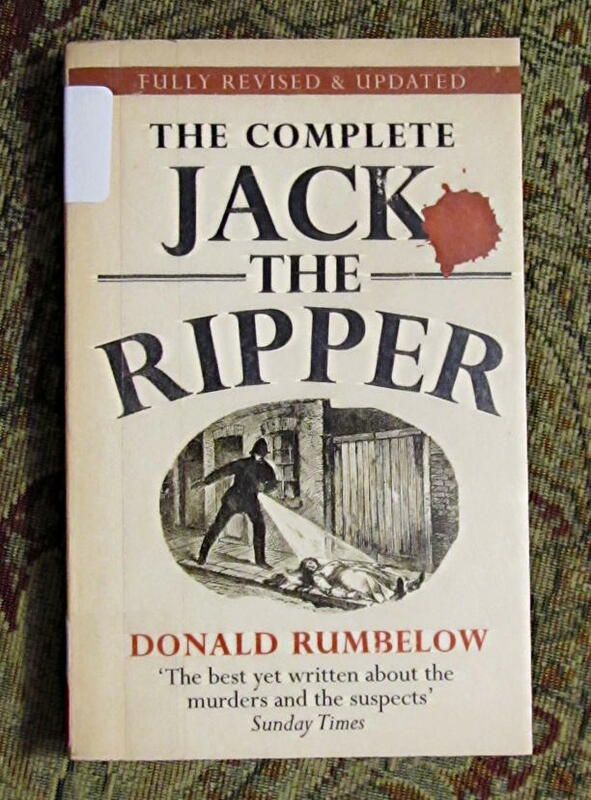 Book Notes: Paul Begg's "Jack the Ripper: The Definitive History"
In an earlier post I wrote up a few of my thoughts on Donald Rumbelow's The Complete Jack the Ripper. 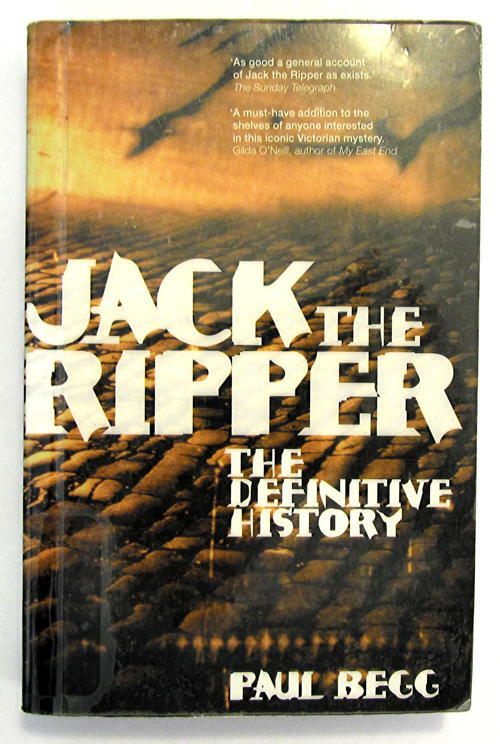 In this post I'd like to say something about Paul Begg's Jack the Ripper: The Definitive History. 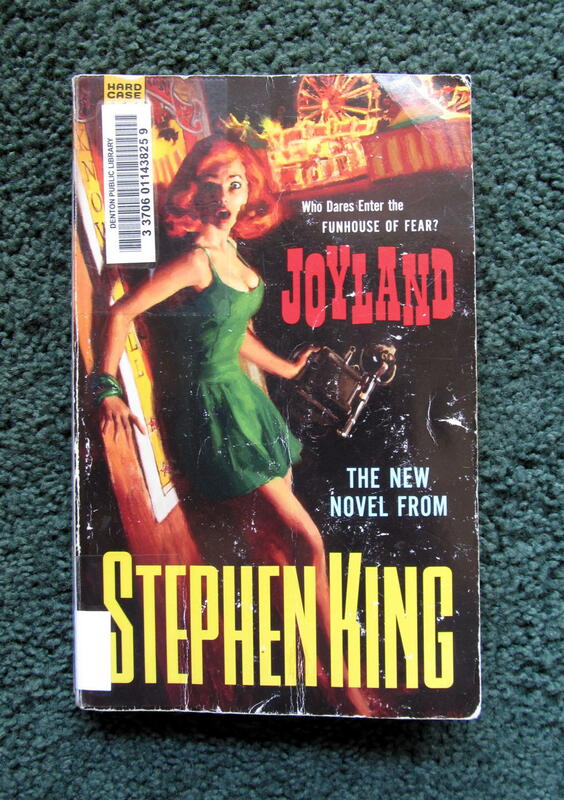 My photos of the 2004 revised paperback edition are of a somewhat battered copy from my local library. 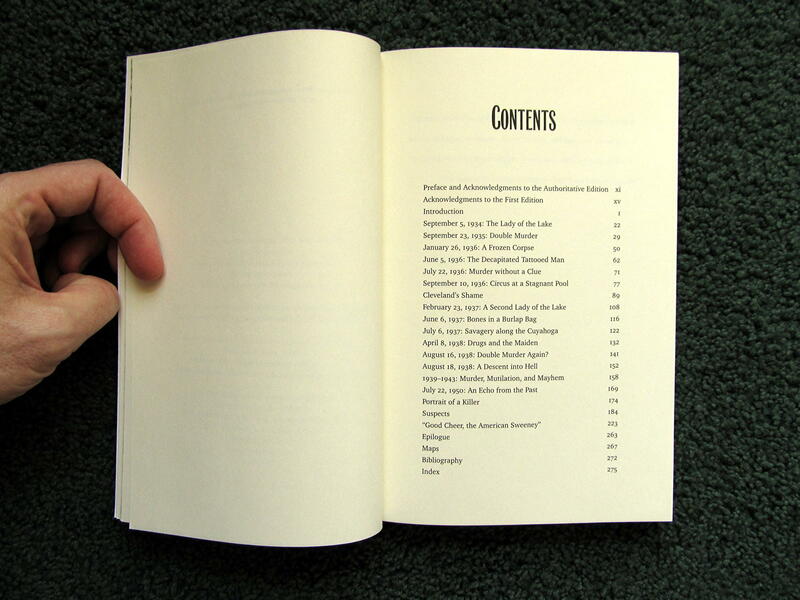 Thus they aren't of the best quality, but they'll give you some idea of the book's cover and table of contents. First, a few words about the apparatus. 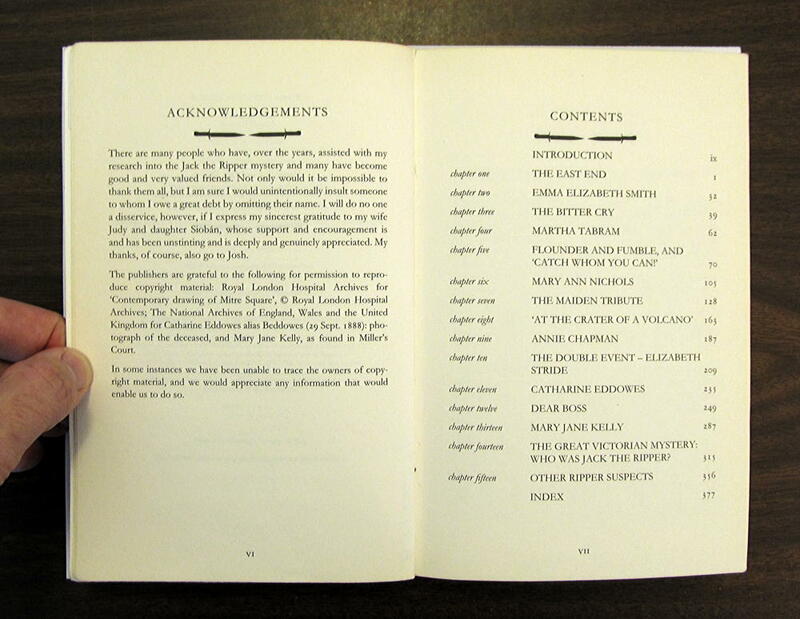 Each chapter of Begg's book contains numerous endnotes that cite many different sources. In my post on Rumbelow's book I complained about the lack of notes. So in this single respect Begg's book is superior to Rumbelow's. Unfortunately, Begg's book, unlike Rumbelow's, doesn't have a bibliography, so you'll have to work through the notes if you want to find suggestions for further reading. This is annoying, since putting together a bibliography is not all that difficult to do. 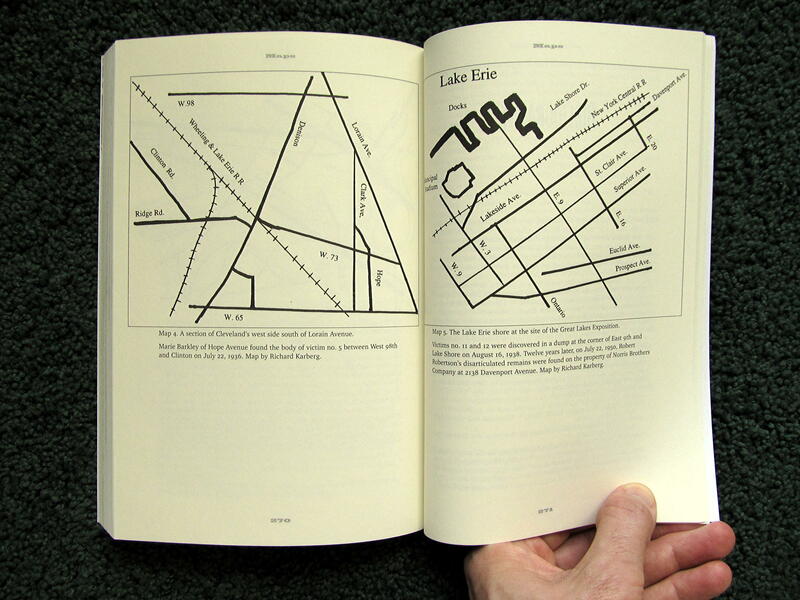 Begg's book, like Rumbelow's, does not contain a single map. Once again, as I mentioned in my earlier post, I don't have a map of the East End in my head. I assume that many readers are in the same situation. Consequently, a map would have been helpful. Overall, therefore, simply because of the endnotes, I prefer Begg's book from the scholarly point of view. Begg's book contains much more social history than Rumbelow's. If you prefer to read a Ripper book that mostly concentrates on the murders, then Rumbelow is probably your man. Of course, the social history is interesting. The extent of poverty and violence in the East End matters for understanding the Ripper's crimes, but knowing about it doesn't really help in trying to determine his identity. So you can take your pick based on the degree of your interest in historical context of the murders. So who was Jack the Ripper? The sad fact is that nobody knows and nobody is likely to know. Having said that, somewhere there may be a document - perhaps misfiled at the Public Record Office, in the archives of a library or maybe sitting in a dusty box in someone's loft - that will reveal all. As things stand, I think Aaron Kosminski is the leading contender, not because I think he was Jack the Ripper, but because of all the policemen who expressed an opinion, Anderson is the only one to have expressed certainty. We need to find out why. Begg is referring to Robert Anderson, who was appointed to the CID during the Ripper investigation. He fingered Kosminksi in his memoirs, but not by name. Only Donald Swanson, in his marginalia to his copy of Anderson's book, identified the killer as Kosminski. Subsequent research by Ripperologists has found only one Kosminski who fits the bill, namely, Aaron Kosminski. Begg's case against Kosminski isn't conclusive, but it's certainly food for thought. In conclusion, I should say that I greatly enjoyed Begg's book. I recommend it to anyone interested in Jack the Ripper. Book Notes: Donald Rumbelow's "The Complete Jack the Ripper"
During the past couple of years I've gotten interested in the work of Colin Wilson. In the future I'll explain why that is so. I'm most interested in his fiction, and recently I've been going through his crime novels. Wilson often wrote about serial killers, both in his fiction as well as his non-fiction; therefore, I've been brushing up on my knowledge of serial killers. So, of course, that requires reading about Jack the Ripper at some point. 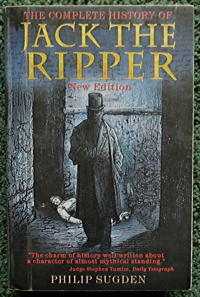 One of the best known books about the Ripper murders is Donald Rumbelow's The Complete Jack the Ripper. It has seen several editions since its initial publication in 1975, and I've photographed the cover of the 2013 edition. Rumbelow's book is an enjoyable work of popular history, although I have to admit that I would have preferred it to be more scholarly. I'm not a big fan of history books without citations. There are no notes of any sort, not even for the quotations, and the bibliography is less than a page. I'm not sure why publishers find this acceptable. I guess, perhaps, that scholarly apparatus puts off some readers, but the lack of proper citations undermines to some degree the intellectual seriousness of any historical book. Sadly, though, we just have to live with this sort of thing in true crime writing. Some books on the Ripper murders contain a fair amount of social history. Rumbelow includes a bit of this, but it's mostly confined to the first chapter. 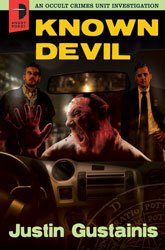 He then constructs vivid accounts of the murder victims and the police investigation. Along the way he argues, somewhat plausibly, that Elizabeth Stride, who is traditionally considered one of the five canonical Ripper victims, was not killed by Jack the Ripper. Instead, Rumbelow claims, on the basis of the eyewitness testimony, that she was murdered by someone who was "clearly passionate" about her, and thus not someone who had merely picked her up on the street. 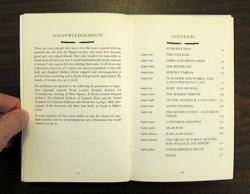 The heart of the book, containing almost half of its pages, is Rumbelow's discussion of Ripper suspects. One thing that I've noticed about Ripper books is the way in which the detailed accounts of the murders provide no real clue as to the identity of the killer. When it comes to naming names, readers inevitably encounter discussions of Melville Macnaghten's papers, Robert Anderson's autobiography The Lighter Side of My Official Life (and Donald Swanson's marginalia in his copy of Anderson's book), asylum records, arrest records, and the like. That is, really nothing in the earlier chapters of a typical Ripper book gives us much help in determining the identity of the Ripper. Rumbelow's book is no different in this regard. He looks at many suspects, even the farfetched ones put forth over the years, but doesn't settle on one as the most likely. The book ends with chapters on the Ripper in popular culture and other Ripper-like killers. Overall, I liked Rumbelow's book and am happy to recommend it. As I indicated above, I would have preferred more scholarly apparatus. Another defect, as far as I'm concerned, is the lack of maps. Maybe other readers have a map of the East End in their heads, but I don't. Even a simple street map would have been a great help. Many publishers pay little attention to this sort of thing. (Military history books routinely have atrociously inadequate maps. Why authors tolerate this sort of thing is beyond me.) But Rumbelow's book is soberly written and free of wild speculation. 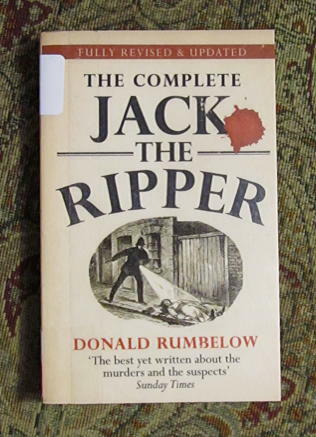 If you're interested in Jack the Ripper, Rumbelow's The Complete Jack the Ripper is well worth your time. 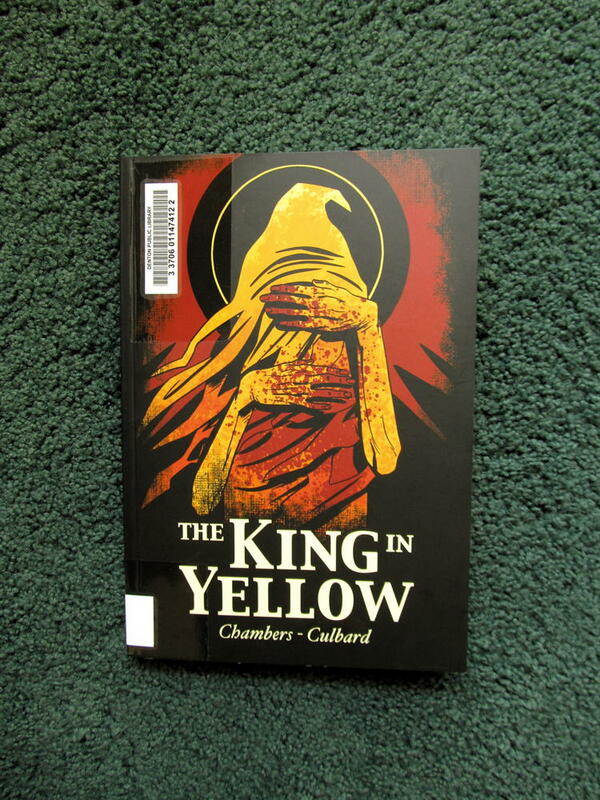 In an earlier post I mentioned that I had started reading graphic novels, and that I had done so under the influence of I. N. J. Culbard. 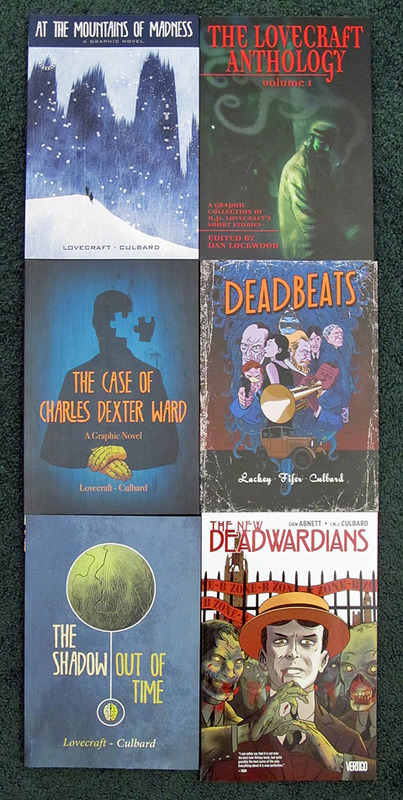 If you look at that earlier post, you'll see that most of his books, or at least most of the ones that I've read, were published by SelfMadeHero, a British press that specializes in graphic novels. I browse their website from time to time, and so I've noticed that they publish, among other things, adaptations of classic works of literature. 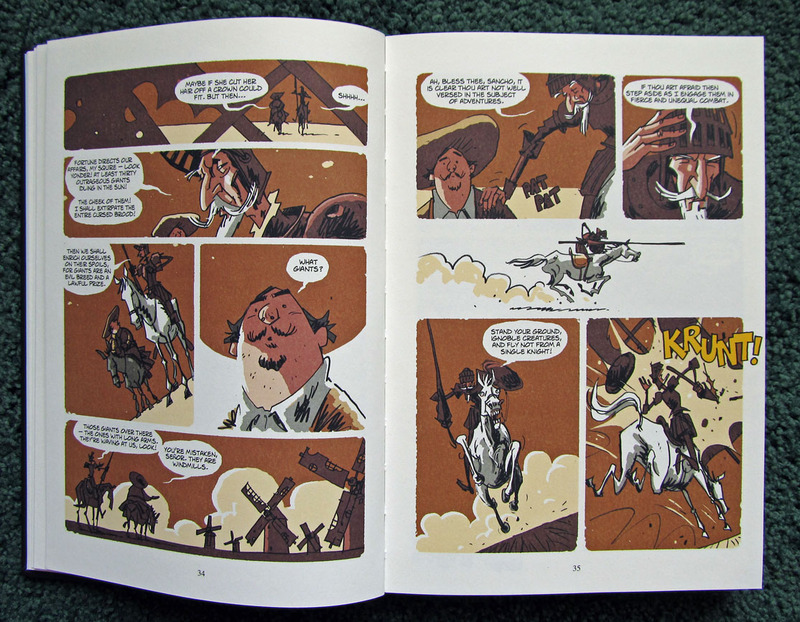 What recently caught my eye was Rob Davis's graphic novel The Complete Don Quixote. 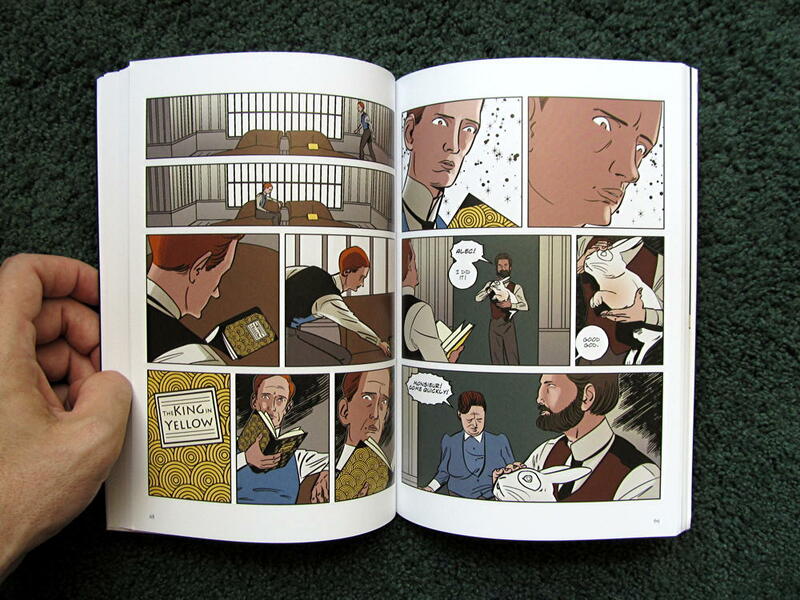 I was already slightly familiar with Davis's work, since he adapted "The Dunwich Horror" in The Lovecraft Anthology, volume one, which was also published by SelfMadeHero. But his work as an illustrator was unknown to me. 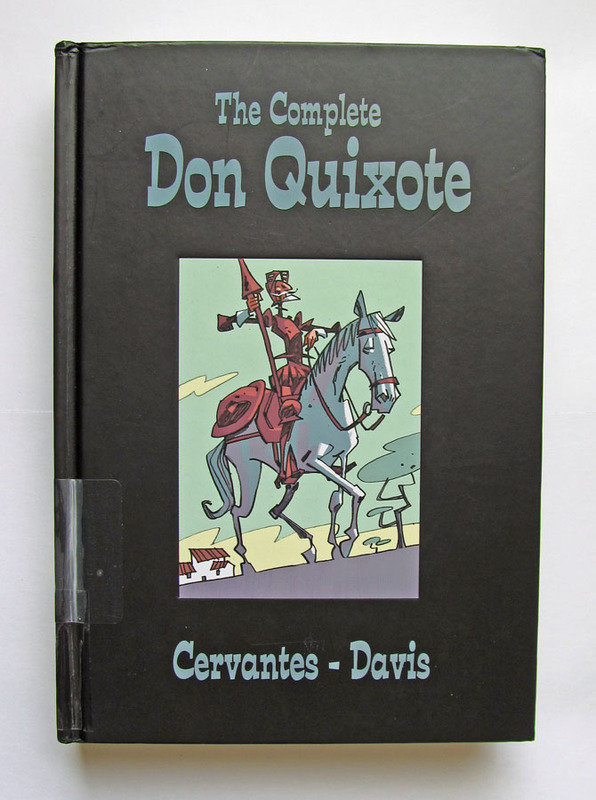 I figured that a graphic novel of Don Quixote would be a worthwhile read, and so I requested it through interlibrary loan at my local public library. Davis's visual style is simple and direct. Nothing fussy, nothing needlessly complicated. Since almost everyone knows the story of Don Quixote and the windmills, I figured that I could include photos of it without spoiling anyone's fun. They'll give you a small taste of the book's visual delights. Once again, simple and direct. 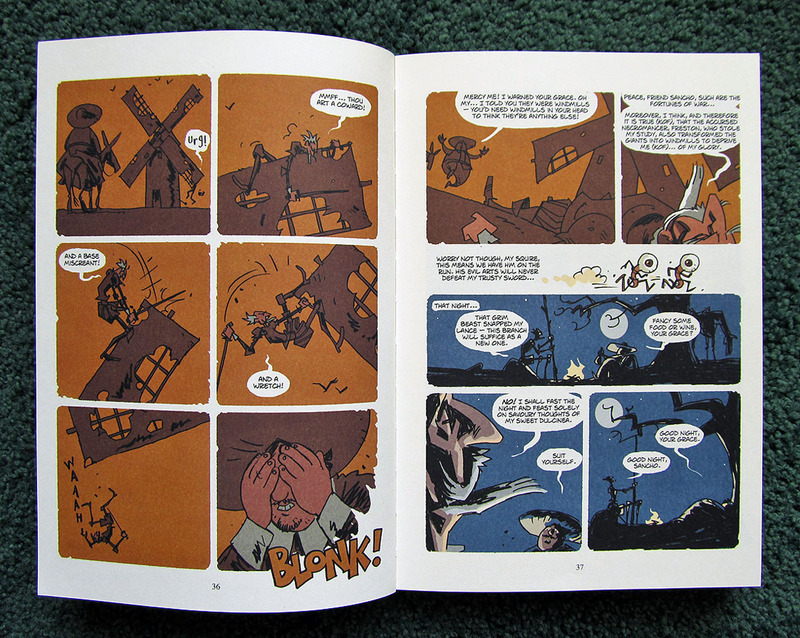 Funny and charming too, in that sad way of so many of Don Quixote's adventures. The comic book sound effects help, don't they? When I was in high school, I read an abridged edition of the original novel in my Spanish class; and when I was in college, I read an abridged English translation in a literature class. That means, unfortunately, that I've never read Cervantes' novel in its entirety in any language. My judgment of Davis's adaptation, based on what I have read and remember of the novel, is that it is a faithful one. He did a very fine job, I think, and so I highly recommend this book. One mark of the success of any type of adaptation of a literary work is whether or not the adaptation leads us back to the original source material. 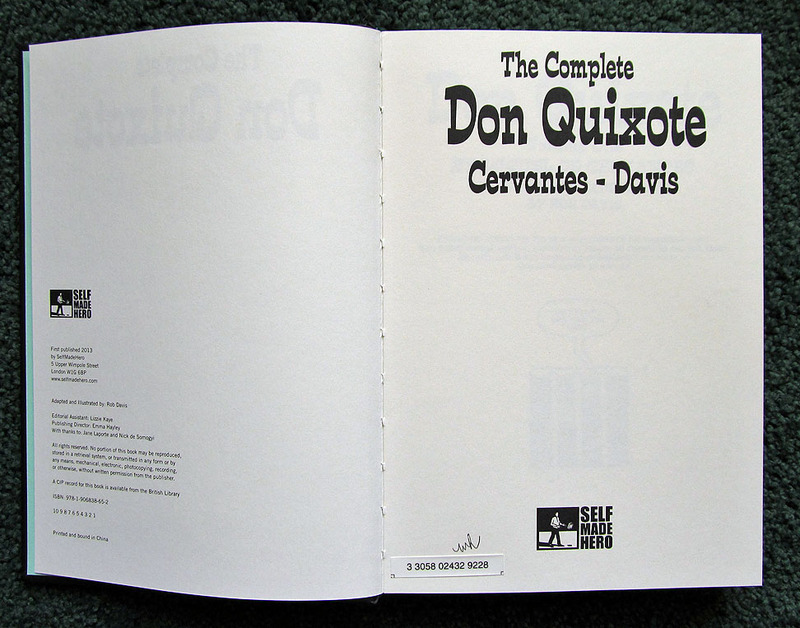 After reading Davis's The Complete Don Quixote I find that I'd like read Don Quixote in its entirety. So now I'm researching various English translations. (Is it my imagination, or are there dozens of them?) I'm even reviewing my Spanish for the first time in slightly over thirty years. I'll read the abridged Spanish edition published by Dover when my skill with the language is back up to speed, and I'll eventually read the entire novel in English. Since none of this was ever really an ambition of mine, I'd like to thank Mr. Davis for prompting me to take up Don Quixote again. I'm grateful for the inspiration.